In March 1917 a poem appeared in the correspondence section of The Times Literary Supplement . It was entitled 'From a Trench' and published anonymously. Because of the title, it was assumed that it had been written by a serving soldier who had experienced all the horrors of trench warfare. But it turned out that the writer was a woman - Maud Anna Bell (1861 - 1947) - who was busily engaged in a Serbian Relief Fund Charity. She had poignantly managed to portray with vivid imagination what the First World War soldiers were going through, and show that the people on the Home Front were all too aware of their plight. It must have caused quite a stir when the writer was found to be someone who had never been near a battlefield. We hear their sobbing breath. That there are crocuses at Nottingham! Of which the people tell. Why! There are crocuses at Nottingham! Because we’re here in Hell. We associate the poppy with the First World War battlefields, not the crocus; but how potently the little purple flowers are used in this poem to alleviate the reality of War. It shows what an impression our local flora and fauna can leave with us when far away from home. Sadly the crocuses of Nottingham have mostly disappeared and been covered by bricks and concrete, but they used to grow in profusion in the Trent-side meadows. Now only a few patches remain. The odd street name like 'Crocus Street' acts as a reminder of the days when these flowers had given such joy to the people of Nottngham. The Gardeners Chronicle of 1872 talked about the hundreds of people gathering them into every container they could find to decorate their living rooms. There are two rare species of crocus in Nottingham, one that flowers in the spring, the crocus vernus, which has three stamens and grass-like leaves that accompany the flowers. The other. crocus nudiflorus, has six stamens, the leaves appear in spring and the flowers come in early autumn when the leaves have died back. The Reverend J.T. Becher of Southwell, who was a knowledgeable plantsman, became renowned for the correct identification of the autumn species, which had been incorrectly named by Charles Deering, a botanist who had published a 'Catalogue of Plants Growing about Nottingham' in 1738. Deering had thought it to be the meadow saffron, colchicum autumnale, but he was wrong. Both are thought to have originated in Europe and arrived locally well before the year 1500 and may have been escapees from ther herbal gardens of monastries. Malaria was endemic in Britain at this time and the wetlands of the Trent valley would harbour the mosquitos that caused it. 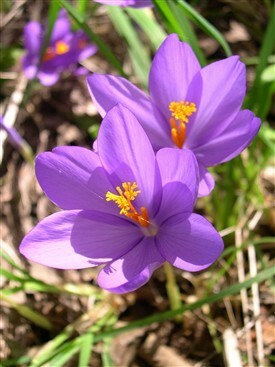 It is thought that a medicinal potion made from the crocuses was used to treat malaria. The good news is that the Nottinghamshire Wildlife Trust are now training volunteers to identify any remaining colonies of the crocuses that have survived. Nearly 9,000 of the crocus vernus were found by the County plant recorder and a team of volunteers on the Nottingham University campus this spring . Maybe in the future the people of Nottingham will have their beloved profusion of crocuses back once more.